Added UI to see current Perfect World account balance and add funds from the main menu. Added ability to purchase keys outside of case opening. Operation Hydra will be extended until November 13th, and passes are now 50% off. Fixed a rare case where Operation Hydra rewards were earned at reduced rate for accounts who maxed out their regular weekly XP. Fixed an issue where the Operation Hydra UI erroneously claimed that more stars would become available next week. Fixed an issue that caused some UI elements to show a gold operation coin for users with diamond coins. Removed weekly “Operation XP Exhausted” end-of-match warning for players with the maximum amount of event stars. After this patch, Operation Hydra will become the longest operation ever existed in the history of CS:GO. 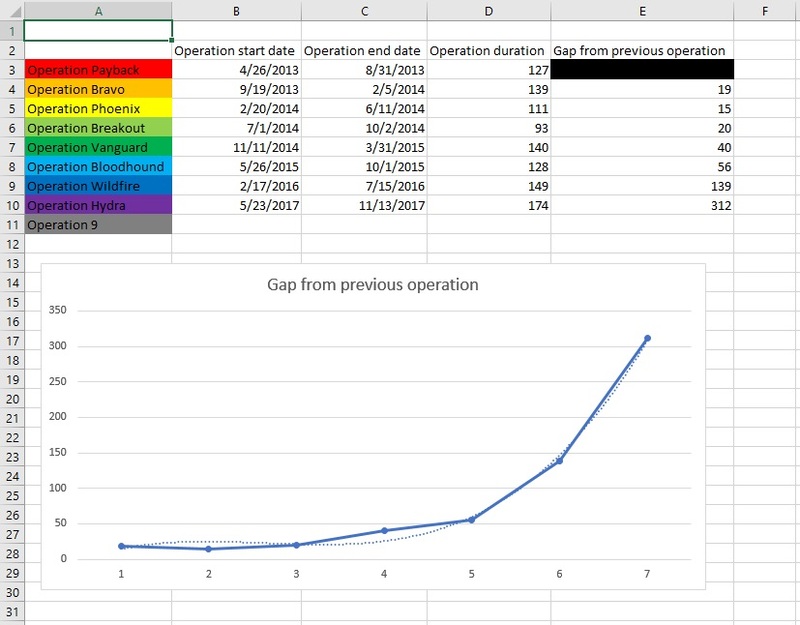 Reddit user /oOMeowthOo shared the table below to show the time frame of each operation. Once Operation Hydra ends, some of its most popular features will live on. First, the most-played operation game modes during the final month of the operation will be added to CS:GO. Second, the most played operation maps of the final month in Competitive Matchmaking and Casual (currently Agency and Austria, respectively) will replace the least played maps in those modes. Fixed some cases where footstep sounds would not be heard. Thanks to /u/Jambozx for his video demonstration this issue. Updated Mac-10 | Oceanic to have more randomness in the texture pattern. The video below illustrates the footstep issue reported by /u/Jambozx. A new update for CS:GO has been released. Previously, we talked about the molotov-smoke bug that was still affecting the game, hopefully this patch will improve the situation. Jess Cliffe, the co-creator of Counter-Strike, announced some adjustments on the new Dust 2 map. All the bugs reported in the past days have been fixed as soon as possible. Valve applied more fixes and changes to Dust II. The co-creator of Counter-Strike, Jess Cliffe, shared the changelog on Reddit. It is finally possible to disable the new audio occlusion system using the option Advanced 3D Audio Processing. Valve listened to players’ complaints. The top 10 most expensive CS:GO items currently available on the Steam market. I explored the market to find out the skins sold fairly at a high price during September 2018.